The story of Ontario is the story of the interaction of people with each other and with the land for over 10,000 years. The Trust’s magazine, Heritage Matters, shares and explores our efforts to conserve and protect these stories of the people, places and events that have shaped our province. 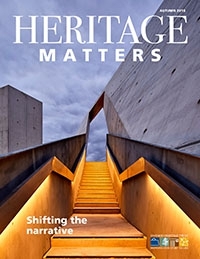 Subscribe to Heritage Matters using the form below and receive this publication by mail twice a year. Or subscribe to our online version.